The Business Litigation Committee of the Philadelphia Bar Association, Business Litigation Section, is a forum for business litigators to network, share best practices, and advocate to make the litigation process better serve the needs of businesses. Members of the Committee include lawyers from firms of all sizes as well as the public and private sectors. The Committee's Annual Commerce Program Reception, usually held in the spring, brings together business litigators and members of the judiciary to celebrate the success of the Commerce Case Management Program of the Philadelphia Court of Common Pleas, which was established in 2000. The Committee strongly supported the establishment of this program, assisted the Court in its implementation, and continues to recruit Judges Pro Tem to serve as volunteer mediators for the Court's Alternative Dispute Resolution program. Other activities include presenting CLE throughout the year, updating our members on developments in business litigation through our list-serv, and collaborating with other Committees of the Bar Association on public service projects. The Committee especially encourages young lawyers who practice in the area of business litigation to join, as the Committee offers unparalleled opportunities to interact with, and learn from, members of the judiciary and experienced practitioners, as well as to speak and publish on topics of interest to business litigators. To get more involved, please contact one of our Committee Co-chairs, Beth Fenton or Marcel Pratt! IN MEMORY OF THE HONORABLE ALBERT W. SHEPPARD, JR. 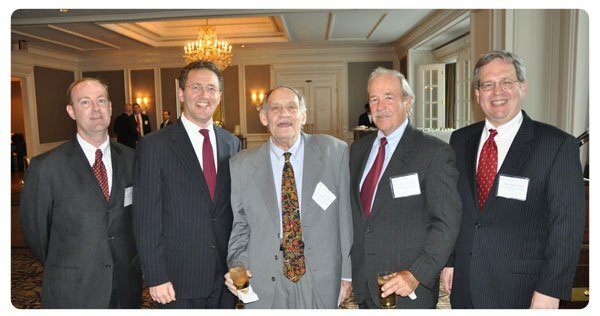 The Business Litigation Committee has lost a great friend and mentor in Judge Albert W. Sheppard, Jr. His wonderful intelligence, which he unsuccessfully tried to hide from us, was only overshadowed by his good nature and his genuine humanity in treating each person before him as a unique individual worthy of his attention. While he was compassionate and decent, he was also unafraid to make decisions when called upon do so -- decisions he made with authority, insight and reflection. And however a case ended, by settlement through his considerable efforts at bringing the parties together, by his judicial decision, or by jury verdict, he left his indelible mark on each lawyer (and juror) before him. Each of us, whether the youngest associate or most seasoned litigator, felt a heightened sense of ourselves when dealing with Judge Sheppard because of the way he treated each of us. His loss now is difficult to bear, but our thousands of cumulative good memories and experiences will carry his life on within our practices and conduct toward each other. As he said to so many of us, we can say about him, "Judge Sheppard, you are a good man." In Judge Sheppard's honor, we would like to put together a collection of our reminiscences. If you would like to contribute to this effort, could you please write up your recollection and email it to David Chanin at dchanin@kleinbard.com or Lee Applebaum at lapplebaum@finemanlawfirm.com. We will collate them and post the final effort on the Committee's website. Kathy Jaffari, partner, Ballard Spahr LLP and chair, Philadelphia Bar Association Business Law Section, and Patricia Hamill. Patricia M. Hamill with Philadelphia Court of Common Pleas Judge Ramy I. Djerassi at the Philadelphia Bar Association's Business Litigation Committee Meeting on Oct. 20, 2015. Judge Ramy I. Djerassi addresses attendees. Philadelphia Court of Common Pleas Judge John W. Herron (from left) is congratulated by Marc J. Sonnenfeld and Business Litigation Committee Chair Patricia M. Hamill at the Committee's annual reception for Commerce Court judges on April 28, 2015 at the Westin Philadelphia. Judge John W. Herron gives remarks at the reception. On April 29, 2014, the Business Litigation Committee held its annual reception in honor of the judges of the Commerce Court. Pictured from left to right are: Administrative Judge John W. Herron; Judge Albert J. Snite, Jr.; Commerce Judge Pamela Dembe; Chief Justice Ronald D. Castille; Commerce Coordinating Judge Patricia A. McInerney; and Michael L. Kichline, Chair of the Business Litigation Committee. At the reception, the BLC honored Judge Snite for his service in the Commerce Program. 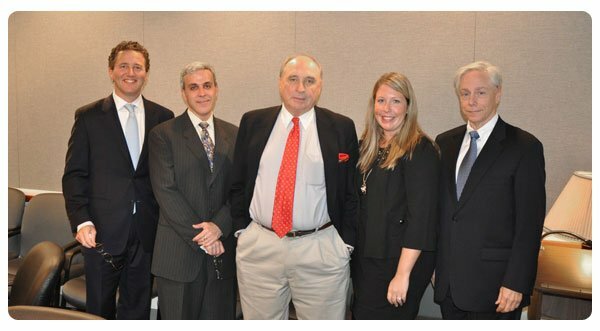 On April 1, the Business Litigation Committee hosted a Commerce Court forum at which the Commerce Judges offered practical tips and advice to members of the BLC. 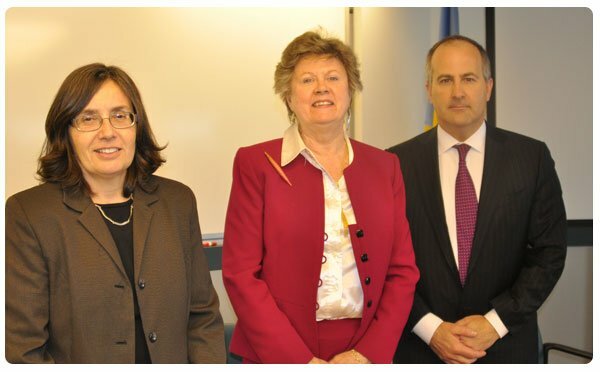 Pictured from left to right are: Coordinating Judge Patricia A. McInerney, Judge Pamela Dembe, and Michael L. Kichline, Chair of the Business Litigation Committee. 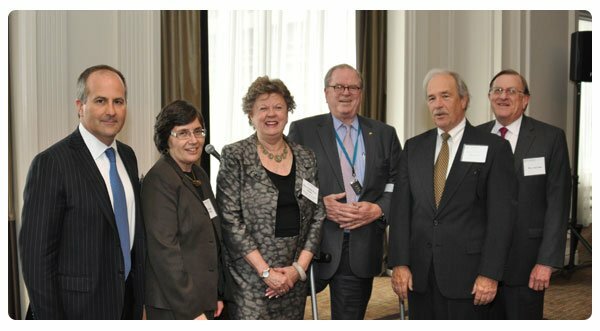 On April 30, 2013, the Business Litigation Committee held its annual reception in honor of the judges of the Commerce Court. 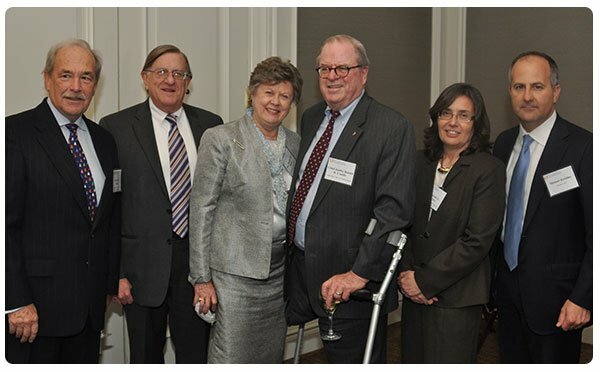 Pictured from left to right are: Michael L. Kichline, Chair of the Business Litigation Committee; Commerce Judge Patricia A. McInerney; President Judge Pamela Pryor Dembe; Chief Justice Ronald D. Castille; Administrative Judge John W. Herron; and Commerce Judge Albert J. Snite, Jr.
Business Litigation Committee Chair Robert R. Baron (from left) joins speakers Craig R. Blackman and Ned Dunham along with moderators Heather Fritts and David Chanin at a joint meeting of the Insurance Law and Business Litigation Committees on Oct. 7. Blackman and Dunham discussed "Business Insurance: Key Risks and How to Cover Them." Eric C. Milby (from left), Business Litigation Committee Chair Robert R. Baron Jr., Judge Albert W. Sheppard Jr., Judge John W. Herron and Business Section Chair Lee Applebaum gather at a June 3 reception to mark the 10th anniversary of the city's Commerce Case Management Program at the Westin Philadelphia. Sheppard and Herron were presented with gavels honoring their instrumental roles in the successful development of Commerce Court. More than 200 people attended the event. Business Litigation Committee Chair Robert R. Baron (from left) answers a question during a Jan. 19 program on the state of Commerce Court as Philadelphia Court of Common Pleas Judges Mark I. Bernstein, Albert W. Sheppard Jr., D. Webster Keogh and William J. Manfredi look on. Pennsylvania Supreme Court Chief Justice Ronald D. Castille (from left) is joined by David H. Pittinsky, Business Litigation Committee Chair Robert R. Baron and Philadelphia Court of Common Pleas Judge Arnold L. New at the Committee's reception for Commerce Court judges on May 28 at the Westin Philadelphia. More than 150 people attended the event. Marc J. Zucker, outgoing chair of the Business Litigation Committee was honored as Committee Chair of the Year at the Business Law Section's annual reception held on January 27, 2009 at the Pyramid Club. Section chair Stephen Foxman presented Zucker with a plaque expressing the Section's “deep appreciation for his initiative and leadership in planning and guiding the committee in 2008. 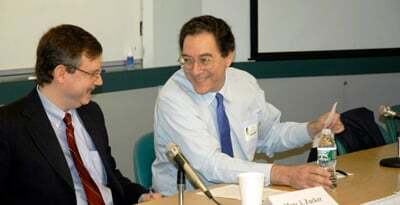 Philadelphia Court of Common Pleas Judge Arnold New chats with Business Litigation Committee Chair Marc Zucker prior to the Committee's Oct. 24, 2008 meeting. 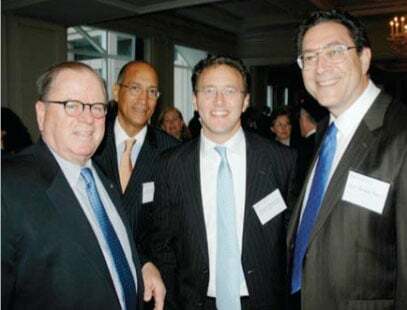 Business Litigation Committee Chair Marc Zucker (from left) is joined by Philadelphia Court of Common Pleas Judge Albert W. Sheppard Jr., Darryl J. May and Judge Mark I. Bernstein at a reception following a training seminar for judges pro tempore at The CLE Conference Center on June 17. To listen to these podcasts go the Speaker Programs section of the Bar Association's podcast library. Philadelphia Court of Common Pleas Judges D. Webster Keogh, William J. Manfredi, Albert W. Sheppard Jr. and Mark I. Bernstein on the state of the city's Commerce Case Management Program at the Jan. 19, 2010 meeting of the Business Litigation Committee. 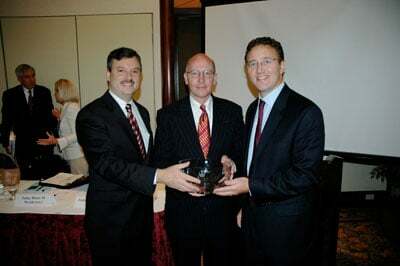 December 9, 2009: U.S. District Court Magistrate Judge Henry S. Perkin, Robert R. Baron Jr. and Charles S. Marion on trade secrets and disclosure at the Dec. 9, 2009 meeting of the Business Litigation Committee. January 15, 2008: Administrative Judge D. Webster Keogh and Supervising Judge Esther R. Sylvester address the "State of the Court" and electronic filing issues. Philadelphia Court of Common Pleas Administrative Judge D. Webster Keogh has signed an Administrative Order amending Section E.1. of Administrative Docket 02 of 2003, which sets forth the process for selection of judges pro tempore in the Commerce Program. Click here for the new order. This Order is the culmination of several years of coordination between the Court and the Business Litigation Committee, through its JPT subcommittee. (2.) participation as a neutral, Judge Pro Tempore, or mediator in a minimum of 3 ADR proceedings, including but not limited to mediations, settlement conferences and private arbitrations, involving the types of disputes that traditionally come before the Commerce Program. Under a grandfathering provision, all existing JPTs have eighteen months, until December 31, 2009, to meet these requirements, and would be permitted to serve in the meantime. In order to assist in implementation of the new Order, assure compliance with the new criteria and inform the Court of the experience and qualifications of the JPTs, the Committee has prepared an online JPT Data Sheet. Commerce Case Management Program Opinions: Negotiable Instruments and the U.C.C. Committee of Seventy's Feb. 17, 2005 "Study and Analysis of the Philadelphia Commerce Program"